a) A technological forecast deals with certain characteristics such as levels of technical performance (e.g., technical specifications including energy efficiency, emission levels, speed, power, safety, temperature, etc. ), rate of technological advances (introduction of paperless office, picture phone, new materials, costs, etc.). The forecaster need not state how these characteristics will be achieved. His forecast may even predict characteristics which are beyond the present means of performing some of these functions. However, it is not within his scope to suggest how these limitations will be overcome. Find the pefect HR software vendor. 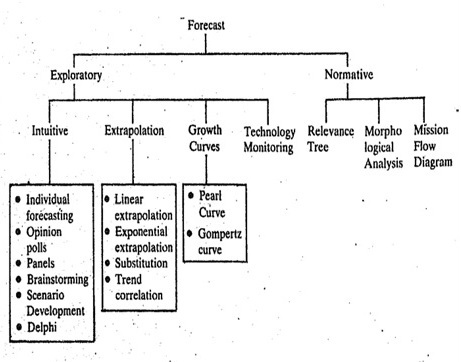 b) Technological forecasting also deals with useful machines, procedures, or techniques. In particular, this is intended to exclude from the domain of technological forecasting those items intended for pleasure or amusement since they depend more on personal fads, foibles or tastes rather than on technological capability. Such items do not seem to be capable of rational prediction and thus the technology forecaster generally does not concern himself/herself with them. Anticipating technological change is an important management function. One must do so to plan new products and new businesses. One must also avoid being technologically blind-sided by competitors with technologically superior products. Yet this is not easy to do because often technological progress cannot be anticipated. However, it can also be planned. Technological forecasting tries to put as much planning as is possible into technological change. Incremental innovations have often been planned or, at least, sought after. The seeking of or anticipation of technological innovation has been called "technology forecasting". Technological forecasting, in the formal sense, has not been widely practised in our country, as it has been used elsewhere, more especially, in industrially developed market economies. This is because commercial success in such economies is dependent, to a large extent, on the ability of a firm or an organisation to identify emerging/future technologies well ahead of time so that appropriate decisions or advance action could be taken to meet/deal with the likely challenges of the future. Recognising the importance of forecasting in the technological planning process, the Government of India has established a Technology Information Forecasting and Assessment Council (TIFAC) under the Ministry of Science & Technology, to promote action oriented studies and forecasting in selected areas. a) Basic Scientific findings/discovery : This establishes the minimum knowledge base on the basis of sound scientific principles from which a solution to a specific problem could be found. the desired way only in the laboratory environment, under controlled conditions and supervision of trained scientists, technologists or technicians. c) Operating Prototype/Pilot plant : On reaching this stage, it would be possible to obtain design/engineering parameters to construct a device/system which would be capable of working in an operational environment using commercially available inputs. d) Commercial introduction or operational use : This stage represents not only technical and design adequacy, but also economic feasibility. Generally, the first production model is the benchmark of completion of this stage. f) Diffusion to other areas : At this stage, the new technology not only replaces the old one, but is also adopted to perform such functions as were not being performed by the earlier., devices and techniques. g) Social and economic impact : At this stage, the innovation will affect the behaviour of the society and its use may reach a point where its impact will be felt on the economy. Every innovation does not go through all these stages. Some may reach a particular stage and go no further. In other cases, two or more stages may be combined. For instance, there may be innovations where the first production model also serves as a prototype. This practice of combining or telescoping stages of innovation is fraught with danger. There are many instances where the first production or operational model of some innovation contained serious flaws which could have been discovered while testing the prototype had it been done separately. Once the production design is fixed, the defects/shortcomings cannot be eliminated at reasonable cost and the device may be unacceptable as it is. used to simulate the operation of a prototype/pilot plant. With the use of the concept of stages of innovation, it is possible to question more precisely just what is meant by a particular technological forecast. One can ask whether the forecast is stating that a certain capability will be technically feasible or whether it will be commercially successful or whether it will be superior to all other approaches to performing the same function, etc. It is important that a forecast concerning one stage is not misinterpreted to apply to a later stage. A forecast of technical feasibility, for instance, must not be confused with a forecast of commercial success. The former does not always imply the latter. We suggest that you familiarise yourself with these concepts by referring to literature and read widely to match your practical experience Having briefly discussed the preliminaries of technology forecasting and technology innovation chain, we now turn our attention to why technology forecasting is necessary. d) Planning for technologies for future needs. (d) the probability associated with the characteristics. The time period may be stated generally, or it may be given precisely. The technology being forecast may be narrowly defined, or it may encompass a very broad range. The characteristics may be stated only in general terms, or may be given precise quantitative values. The probability associated with the characteristics may be given only generally, as high or low, or it may be stated in precise quantitative terms. And for each of these elements of the forecast, the degree of precision may vary anywhere between the two endpoints of generality and precision. The precision associated with each element of a forecast should be determined by the use to which the forecast will be put. The forecast should thus be tailored to the decision making situation, and the precision associated with each of the elements should be appropriate to this situation. (e) taking crisis action to meet the situation. All of these, he showed, may spell disaster for a firm or an organization. On the other hand if a decision maker has several alternatives open to him, he will choose the one which provides him with the most desirable outcome. Thus, his decision is invariably based on a forecast. The decision maker does not have a choice as to whether or not he will make use of a forecast; his only choice is whether the forecast is obtained by rational and explicit methods or by intuitive means. The virtue of the use of rational methods is that they are teachable and learnable; they can be described and explained. They provide a procedure which can be followed by anyone who has been able to undergo the necessary training. In some cases, in fact, the methods are even guaranteed to produce the same forecast regardless of who makes it. The virtue of the use of explicit methods is that they can be reviewed by others. In particular, the forecast can be reviewed by several people prior to its acceptance by the decision maker. All these discussions basically highlight one very important aspect that we are dealing with a probabilistic situation and we should gear ourselves to meet it with a certain degree of confidence and with all elements of surprise anticipated. A logical question that 'follows is: How good is the forecast? Will it come true? We would attempt to analyse the efficacy of forecasting in these situations. a) Absolutely no control : Consider a commuter seeking a forecast of the commercial availability of a solar-powered car, say by the year 2018. While he might seek the forecast out of simple curiosity, more likely he wants to make plans for some activity which will be affected by this forecast, say whether to buy a petrol-driven car or not. Naturally, he wants to plan correctly, for if he bases his plans on a forecast of a solar car becoming available and it does not materialise, the forecast has been useless to him or, worse, it has misled him into foregoing his buying a petrol-car. It appears, then, that such a forecast has to be correct to be useful. When a decision maker has absolutely no control over the outcome of a particular situation (that is, when none of the actions open to him can alter the outcome), he wants to tailor his actions to the eventual outcome. He wants to maximize the benefits from a favourable, or minimize the impacts of an unfavourable outcome. In this situation, if the forecast does not come true, it is of no utility to him. b) Partial Control : Most day-to-day decisions fall in the area of partial control over the outcome. The decision maker is interested in influencing the outcome of a situation in a way as favourable as possible to him, If he is presented with a forecast which he considers desirable, he will exert such control as he possesses to ensure that the forecast is realized, thus influencing either the reliability or the time frame of the forecast, Likewise, if he is presented with a forecast he considers undesirable, he will exert his control to forestall it. Thus, there will be a certain element of self-fulfilment or "self-defeat in the outcome of the forecast. c) Full control : At the other extreme, when the decision maker has complete control over the outcome, he does not even need a forecast. The outcome will be what he wants it to be. Someone else may perhaps find a forecast of his decision useful, but he himself does not need a forecast of what he is going to do. This means that the goodness of a forecast cannot be measured in terms of whether it came true. Suppose that a decision maker is presented with a forecast of an undesirable outcome. As a result of the forecast, he acts to forestall the undesirable outcome, and is successful in doing so. He thereby negates the forecast. But can it be said that the forecast was wrong and, therefore, worthless? On the contrary, it must be recognized that it was highly useful to the decision maker. Had it not been made, he might not have acted as he did, and would, therefore, have been faced with an undesirable outcome. The same situation can arise where the decision maker acts to achieve a favourable outcome on the basis of a forecast that such an outcome is possible. This forecast was useful, not because it automatically came out true, but because it caused the decision maker to take appropriate action. At the moment, however, we will only note that the measure of the value of a forecast is not its validity, in terms of whether or not it comes out true, but its utility in helping the decision maker make a correct and timely decision. It is essential to recognise that a forecast does not put anything into the future. Instead, it tells only of the implications of available information about the past. These implications are connected with the future through a logical framework. Hence, the utility of a forecast for decision making purposes depends on the validity of the logical framework it uses and the extent to which it extracts all the implications which are contained in the body of available information. This ability to evaluate the utility of rational and explicit forecasts is, of course, one more reason to prefer this type of forecast. However, it may be emphasised that following a certain procedure may not guarantee the forecaster against error; it may only reduce the likelihood of error. Hence, the forecaster is never absolutely certain that he has prepared the most useful possible forecast with the available data he has and the resources he has employed. f) It furnishes warning signals, which can alert the decision maker that it will not be possible to continue present activities. If the forecast makes a decision maker aware of alternatives which he might not have discovered otherwise, it has increased his degree of freedom. The important point is that the purpose of the forecast is to improve the quality of his decisions and not to force him to accept a particular decision.